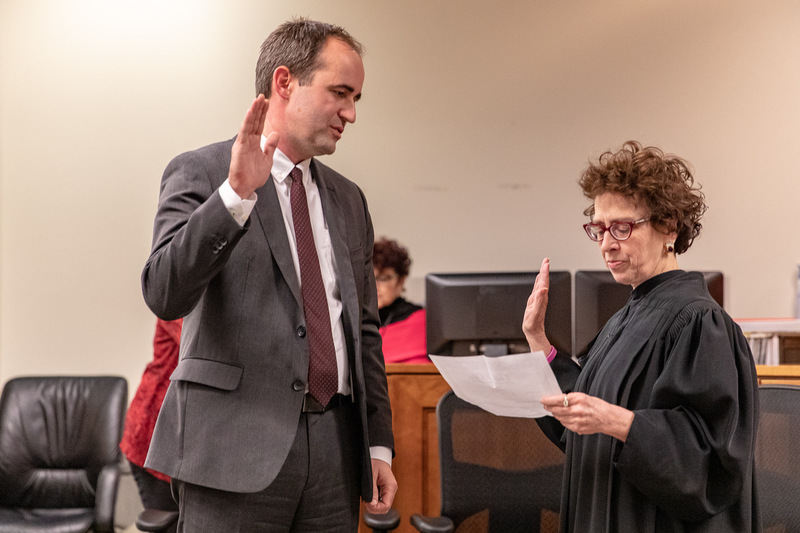 On Tuesday, January 15, 2019, Joe Campagna was sworn in as the newest judge on the Shoreline District Court. Joe takes the position formerly held by Doug Smith, who retired after 30 years on the bench. The second District Court judge is Marcine Anderson. Both justices live in Shoreline. 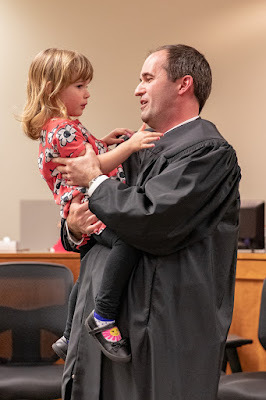 The ceremony was presided over by Donna Tucker, Chief Presiding Judge, District Courts, and attended by a courtroom full of judges, attorneys, and family, and half a dozen toddlers, including the Campagna's 4 year old daughter Mira. The oath of office was administered by Supreme Court Justice Sheryl McCloud. A friend and associate of Joe's flew in from New York City, where he is an attorney for the ACLU. He spoke of how no matter what the task at hand, Joe would always do "more." Joe, in an emotional speech, thanked his wife Margaretta for her unfailing support, not hesitating to jump into a campaign with a tiny, new baby. He thanked his extended family for their support as well as the judges, and city councilmembers who supported his campaign. "The District Court is most citizens' primary contact with the American judiciary system," Joe said. "I am humbled and honored to be elected to this position and look forward to starting work tomorrow!"